Almighty God, who hast restored our human nature to heavenly glory through the perfect obedience of our Savior Jesus Christ: Enliven in thy Church, we beseech thee, a passion for justice and truth; that we, like thy servant Federick Denison Maurice, may work and pray for the triumph of the kingdom of thy Christ; who liveth and reigneth with thee and the Holy Spirit, one God, now and for ever. Amen. Almighty God, who restored our human nature to heavenly glory through the perfect obedience of our Savior Jesus Christ: Enliven in your Church, we pray, a passion for justice and truth; that, like your servant Federick Denison Maurice, we may work and pray for the triumph of the kingdom of your Christ; who lives and reigns with you and the Holy Spirit, one God, now and for ever. Amen. F D Maurice was born in 1805, the son of a Unitarian clergyman. 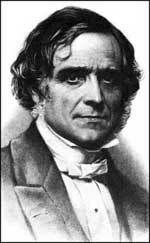 He studied civil law at Cambridge, but refused the degree in 1827 rather than declare himself an Anglican. However, he was later converted, and in 1834 was ordained to the priesthood. Soon after his ordination, Maurice became Professor of English Literature and History at King's College, London, and in 1846, Professor of Theology as well. However, his book Theological Essays, published in 1853, was regarded by many readers as doubtfully orthodox, and the resulting furor cost him his professorships. In 1854, he founded the Working Men's College, and became its first head. He was professor of Moral Theology at Cambridge from 1866 until his death in 1872. A friend of mine, who has read considerably more of Maurice than I have, says of the Theological Essays: "Maurice has a sneaky approach. He begins an Essay by considering an objection to traditional Christian theology: for example, the objection that the instructions supposedly given by God to the Israelites to massacre the inhabitants of Canaan are morally indefensible. He begins by conceding his opponent's assertion, by granting that indeed it is preposterous to suppose that God would ever do anything of the kind. He then invites his opponent to consider how it is that we come to believe that the wholesale slaughter of defeated opponents in war is wrong. (A glance at any history of the Pelopennesian War, by Thyucidides or another, will make it clear that the Ancient Greeks did not share this view.) He explores with his opponent the question of the role of Israel in the moral and spiritual development of mankind -- the implications of the fact that the overwhelming majority of those who believe that it is wrong to slaughter a defeated people originally got that idea from sources traceable back to the religious ideas of the ancient Israelites. He points out that, if there is a God and He has revealed Himself, there is reason to suppose that the history of Israel is a part of that revelation. And by the time he is done, he has won more territory than he appeared at first to be losing." That, at any rate, is what he finds in Maurice. Other readers give different reports that leave me wondering whether they have read the same author. Several of his sermons and meditations are online, thanks to Project Canterbury.